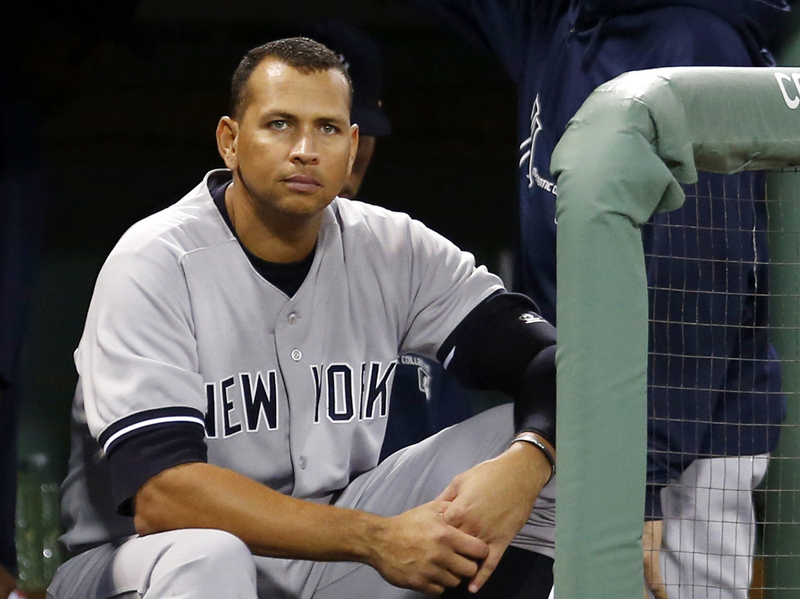 Yankees' A-Rod Says He'll Retire After 2017 Season : The Two-Way Alex Rodriguez, 40, says it's time to "go home and be dad." But he's giving fans two years to get to the park to see the end of his playing career. New York Yankees' Alex Rodriguez sits in the dugout during a game against the Boston Red Sox at Fenway Park in Boston in 2013. Giving nearly two years' notice, New York Yankees' veteran Alex Rodriguez announced his retirement from playing at the end of 2017 season when his contract with the team is up. "I won't play after next year," Rodriguez, who turns 41 in July, told ESPN. "I've really enjoyed my time. For me, it is time for me to go home and be dad." Rodriguez's retirement will mark the end of a long but tumultuous baseball career. In his 20 seasons in the league so far, Rodriguez has been named the American League MVP three times, has been nominated to the A.L. all-star team 14 times, and was part of the Yankees' World Series winning team in 2009. The designated hitter also enters the 2016 season with 687 career home runs, needing just 28 more to pass Babe Ruth for third on the all-time list. But Rodriguez's career will be forever shadowed by using performance-enhancing drugs, for which he was suspended for the entire 2014 season. Major League Baseball said he used numerous performance-enhancing substances and then tried to "cover-up" his use by obstructing baseball's investigation. At the time of the suspension, Rodriguez maintained he did not use performance-enhancing substances, though when he returned to baseball before the the 2015 season, he released a handwritten letter to fans that said, "I take full responsibility for the mistakes that led to my suspension for the 2014 season." He also wrote, "I regret that my actions made the situation worse than it needed to be. To Major League Baseball, the Yankees, the Steinbrenner family, the Players Association and you, the fans, I can only say I'm sorry." Though he missed a full season, Rodriguez was able to put together an impressive 2015 season, especially for his age. According to ESPN, he tallied his highest number of runs scored (83) since 2008, most at-bats (523) and games played (151) since 2007, and his best slugging percentage (.486) since 2010. Plus his 33 home runs last season were the sixth-most in MLB history for a player 39 years of age or older. It will be interesting to see how Rodriguez's extended farewell tour unfolds in comparison with those of his teammates, the universally beloved shortstop Derek Jeter, who retired in 2014 and the legendary relief pitcher Mariano Rivera who retired in 2013. Both of those players enjoyed unbesmirched reputations and were sent off with tearful goodbyes and much fanfare.